Butterfly (or single vane) dampers are usually best suited for open/closed or isolation duties as the sealing periphery of a single vane is minimal relative to the duct area. 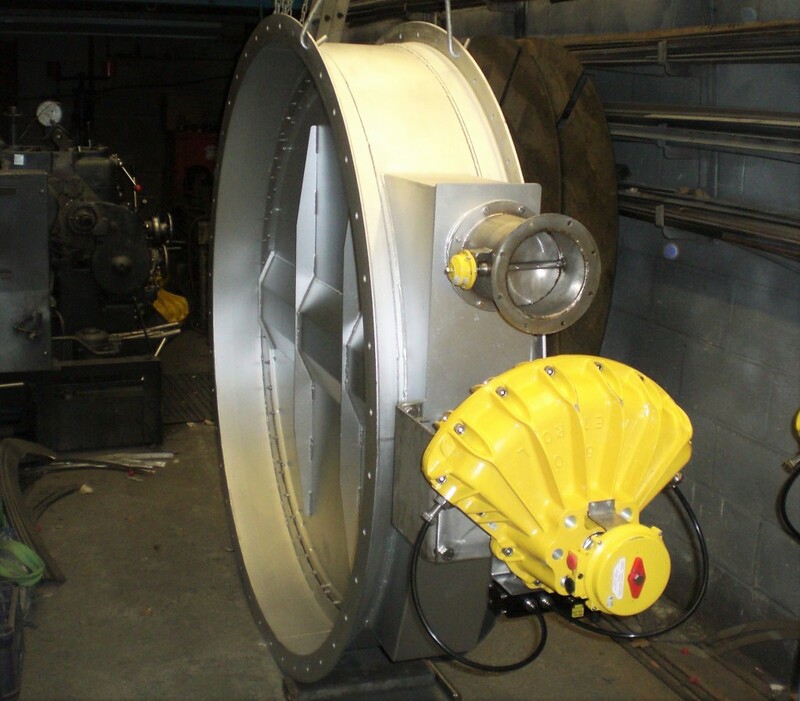 However, where cost is of prime consideration single vane dampers can still offer reasonable flow control, although a twin vane or multi-vane damper will generally perform better in this capacity. 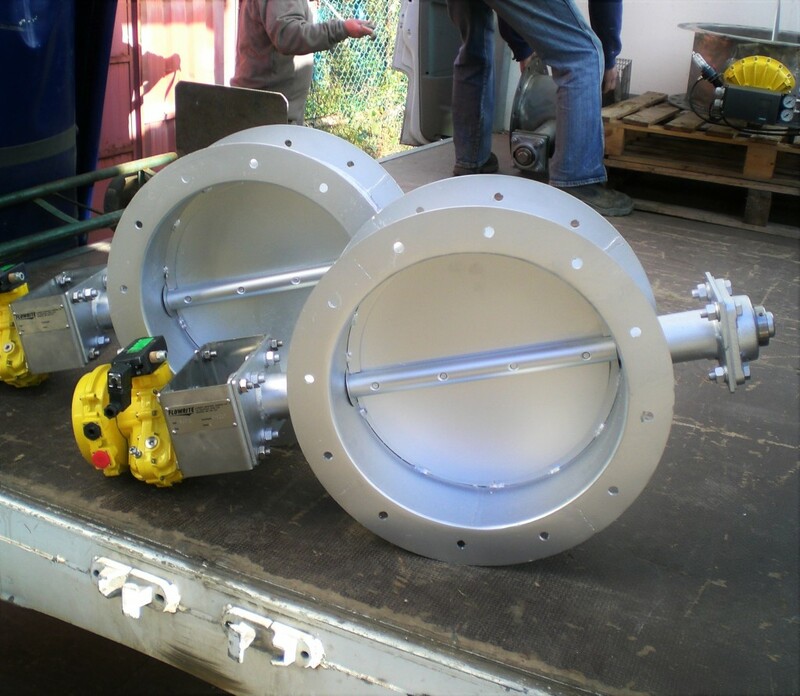 All Flowrite dampers are sized to suit specific customer requirements with our circular single vane dampers ranging in size from roughly 75mm to 4m in diameter. We also manufacture square and rectangular single vane dampers with comparable cross-sectional areas. Our single vane dampers can be supplied in carbon steel or in a wide range of stainless steels including grades 304, 316, 310, 253MA, Duplex 2205 and Hastelloy (depending on the specific operating conditions the application demands). We design dampers for use in extremely low ambient temperatures as well as for use in extremely high process temperatures (up to 950°C). Our dampers can also be designed for use in corrosive coastal environments and in applications where the duct gases themselves have corrosive or abrasive constituents. 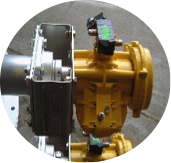 Our dampers can be fitted with various actuation options – click here or follow the navigation for further information on actuation options. Flowrite single vane dampers are subdivided into two categories – (i) shut-off dampers (single seal), (ii) isolation dampers (twin vented seals). 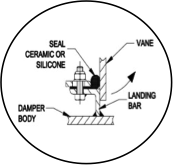 Shut-off dampers (single seal), as the name suggests, use a single seal row and can incorporate various seal designs and seal material options depending on what the operating conditions demand – click here or follow the navigation for a more detailed description of our seal options. Isolation dampers (twin vented seals) use a double row of seals and a vented seal ‘inter-space’ to achieve a 100% sealing efficiency of the process gas from upstream to downstream of the damper. Click on the images below for more information about both shut-off dampers and isolation dampers.